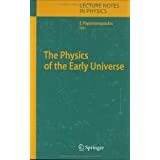 The Physics of the Early Universe is an edited and expanded version of the lectures given at a recent summer school of the same name. Its aim is to present an advanced multi-authored textbook that meets the needs of both postgraduate students and young researchers interested in, or already working on, problems in cosmology and general relativity, with emphasis on the early universe. A particular strong feature of the present work is the constructive-critical approach to the present mainstream theories, the careful assessment of some alternative approaches, and the overall balance between theoretical and observational considerations. As such, this book will also benefit experienced scientists and nonspecialists from related areas of research.